Since 2013 when the American Library Association (ALA) announced the formation of its Center for the Future of Libraries, it has focused much of its work on identifying new emerging trend relevant to libraries, librarians, and their communities. Though we can't predict the future, we can identify trends. Understanding these "currents" shaping society can better enable us to envision the future. ALA's Center is itself modeled on the American Alliance of Museums' (AAM) very successful Center for the Future of Museums (CFM), which highlights social, technological, political, and economic trends ways that museums are addressing these trends. So it is not surprising to find that an emerging trend that both libraries and museums are rushing to address is the desire for spaces that accommodate hands-on creation, often being referred to as "Makerspaces." David Thornburg's recent book, From the Campfire to the Holodeck: Creating Engaging and Powerful 21st Century Learning Environments, identifies essential, or "primordial", learning environments, which he defines metaphorically as the Campfire, the Watering Hole, the Cave, and Life. Thornburg has been called a "premier futurist for educational technology". He argues that students need to be prepared for their future, not for our past. He stresses that students learn best where they are constructors of their own knowledge, and in ways conducive to their own learning styles. It seems fitting that Thornburg, a brilliant left-handed scientist who in the 1970s had worked at Xerox Palo Alto Research Center (PARC) where he invented some user-interface tools that Steve Jobs embraced and that are used in computers today, and who has been responsible for a variety of interesting and diverse inventions and patents, be an introductory guide for a new type of 21st century educational environment. Yet the places that Thornburg defines in his book need new architectural form: The challenge remains how best to define them. There are, of course, many excellent and life-changing teachers. Yet it is still true that all education at some point involves self-education, as it progresses from knowledge to understanding. The Cave is a place where this can happen. Libraries provide an ideal "Cave" setting, where young learners can have time alone, for self-study, to think and reflect, in a way not always possible at school or home. "Life," Thornburg's fourth educational environment, is where education is tested, where learners learn what they know and don't know, where education deepens, and where things learned are meaningfully applied. In many Libraries today, spaces for the "Life" learning stage are now seen in the growing popularity of Makerspaces, where libraries allow young learners spaces for hands-on projects. Here they can apply their learning, to find out what they know and don't know. The Makerspace invites young learners to apply STEM learning and digital technologies, which must be aligned with traditional modes of programming, collections, and the budgets necessary to develop, sustain and maintain them over time. A popular design strategy with these is to build in flexibility for incorporating the evolving nature of technology and its related pop-up seasonal programming. The ubiquitous multi-purpose room can here be recalibrated and better focused, and filled with art, personality, program, plug-in power, and flexible use. 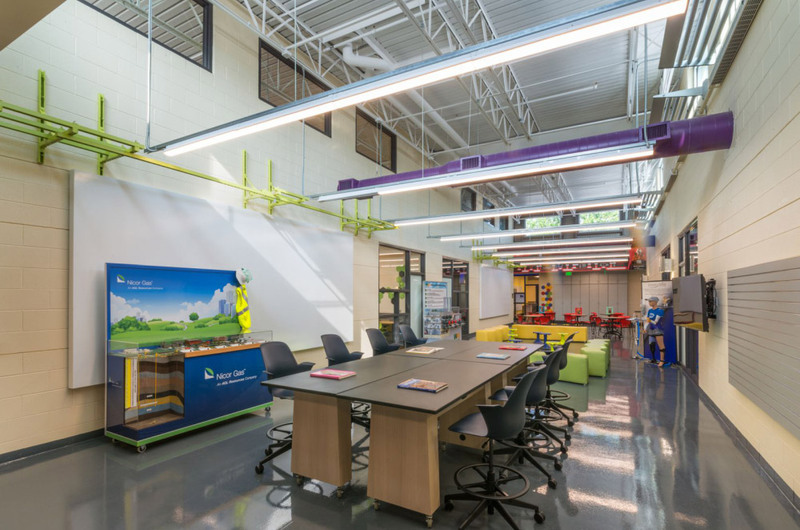 At the Santori Public Library in Aurora, Illinois, one of our most innovative Makerspace designs was implemented as a flexible, cutting-edge crafting area. This Makerspace not only offers the most up-to-date technology but is also self-sustaining for the library, bringing income through small monetary charges per craft made. A parallel emerging trend in program administration for teen services is "design thinking." Though not an entirely new concept to libraries, there has been growing interest in it, especially for teen services. Design thinking is a formal, creative method to stimulate problem solving and innovation. A core component of its method is that it places people first. Libraries in turn are themselves using design thinking to reimagine services and spaces for teen patrons, and are experimenting with ways to help teens apply design thinking to their own learning experiences. Makerspaces are playing an increasingly important role, and continue to be adopted by public, academic and K-12 libraries everywhere. Janet Nelson Director of Library Engagement and Solutions at Demco, notes that although Makerspaces were not even mentioned in the 2014 Horizon Reports for K-12 Education and (Academic) Library, by 2015 reports indicated these were not only trends, but were being recommended for immediate adoption. "A trend that I expected to be much more likely to be adopted in public libraries, quickly found a place with schools and universities as it fits so well with the 'hands-on learning' models that have been so readily accepted" Nelson said. Within libraries, this growing role is being addressed in a variety of ways: Ranging from a specific space or set of spaces, to community platforms that further patron interests and stimulate exploration. Makerspaces are gaining popularity with older learners and library patrons as well. Libraries are adapting their spaces and resources to respond to a growing desire to create original content. Though libraries have long featured crafts oriented programs such as needlework and knitting, building, and "upcycling," with Makerspaces they are taking on a new, more technological orientation. Wired magazine notes that people are seeking "access to new forms of literacy" like "design, programming, video editing, book writing, and website building." This is resulting in dedicated makerspaces, "tinkerlabs," and other reconfigurations of a library's space. Libraries are encouraging creativity in a variety of ways, from low-tech hands-on engineering toys and kits for children and teens, to offering laser cutters and 3D printers for more advanced projects. How are makerspaces changing users' perceptions of the library ? Innisfil (Ontario) Public Library's Aaron DeVries, ideaLAB manager, DEVRIES: "We put a new name- ideaLAB -and logo on the building. We intentionally didn't have "library" on the building at first. When we first had 3D printing in our branches, there were a lot of questions about why it was in a library. When we dedicated space to it and gave it equal status to collections, people stopped questioning it, and they realize how the makerspace and the library can be married." Megan Danak, principal librarian at Tampa-Hillsborough County (Fla.) Public Library System's The Hive DANAK: "There's a lot of push toward entrepreneurial culture in Tampa, but I wasn't expecting so much of the business community to be so interested. Inventors and businesspeople are asking about making prototypes on our machines. The makerspace has a lot of firsts for us in terms of technology, and the first thing that comes out of most people's mouths is, 'I never thought this would be in the library.'" Susan Downs, CEO DOWNS: "We like the idea of the community kitchen, where everyone is creating and discussing and arguing together. That's engaged the people who walk through the door and it's created a very different environment than the transactional model of library service that has dominated library thinking for the past 50 years." Virtual reality (VR) has exploded in the mainstream. VR allows users to immerse themselves in a virtual environment using a headset. Current VR headsets include high-end devices such as Occulus Rift and HTC Vive, the mid-level priced Samsung Gear VR, and the cheap but effective cardboard viewers. Apple is rumored to be developing a device. On the production side, 360 cameras such as the BublCam, allow users to create VR content. 360 live video streaming is also something we're keeping an eye on. Gaming and entertainment will be the first to demonstrate the capabilities of VR, but the potential for VR to reshape education, communications, and social networking are also exciting. Public libraries such as Edmonton and Innisfil have begun to offer access to VR tech. This Spring, TPL piloted an Introduction to Virtual Reality program using cardboard viewers and we are looking to offer more VR equipment and programs this Fall. Augmented reality (AR) is a "cousin" of VR with a key difference. In an AR experience, digital content is layered on top of real world objects - "augmenting" it - and the augmented content is usually viewed through a device such as a headset or mobile device. Like VR, tech companies are investing in AR, such as Microsoft's HoloLens headset. A developer edition is now shipping. We are not aware of too many examples of AR applications in a public library setting - and we'd love to know about them! - and we're monitoring how AR is being applied in other environments (such as Royal Ontario Museum's Ultimate Dinosaurs AR App) with interest, to help imagine how AR could be adapted into our spaces and services. Robots, smart cars, and other "intelligent" machines are capturing the public's attention as tangible examples of artificial intelligence (AI). You may have heard a while back about IBM's Watson competing and winning against humans on Jeopardy or the dark results of Microsoft's Tay, a "female teen" AI that recently joined Twitter and was quickly taken offline after her behavior became rather colorful. Pop culture fans often recall the doomsday Skynet scenario from the Terminator movies when they think about AI. While AI has its famous critics, such as Stephen Hawking and Elon Musk, it also has advocates, as many universities and startup companies are exploring its potential in the realm of healthcare, finance, and urban planning. Like with augmented and virtual reality, TPL has much to learn about AI. To get our feet wet, we will host a series of talks about AI at our Digital Innovation Hub branch locations this fall. This Spring, Toronto Public Library (TPL) launched our Pop-Up Learning Labs, a service that consists of three mobile equipment kits that travel to branches across the city that do not have a Digital Innovation Hub. Pop-Up Learning Labs bring technology programming to TPL branches that do not have a Digital Innovation Hub, such as Northern District Branch pictured above. Each Lab stays at a branch for a month. A dedicated Pop-Up staff works with local staff to deliver technology programs such as 3D printing and 3D design. Equipment available include a 3D printer, Lego Mindstorms robotics kits, Snap Circuits, and Arduino kits. A pop-up model offers library systems a comparatively cost-effective model to bring technology services and programs to communities that do not have convenient access to a makerspace. TPL hopes to double the number of Pop-Up Learning Labs available soon. One key lesson TPL learned from observing other library makerspaces and through our own experiences is that animating a makerspace is key. Libraries may offer a diverse array of programs including 3D design, photo, video and audio editing, coding, Arduino, and robotics. Community partnerships are also key in animating the library with new technology, expertise, and ideas. This July, TPL will once again host the Maker Festival, which is expected to attract 10,000 makers to the Reference Library. Other exciting partnerships include a hackathon in September with Open Data Institute of Toronto and Open Data Toronto, wearable tech meetups with We Are Wearables, and the Open Data Book Club monthly discussions. Toronto is home to a vibrant maker community and TPL has greatly benefited from their spirit of collaboration. Likewise, other libraries can consider their community. There will undoubtedly be wonderful makers who are open to collaboration. Happy making!